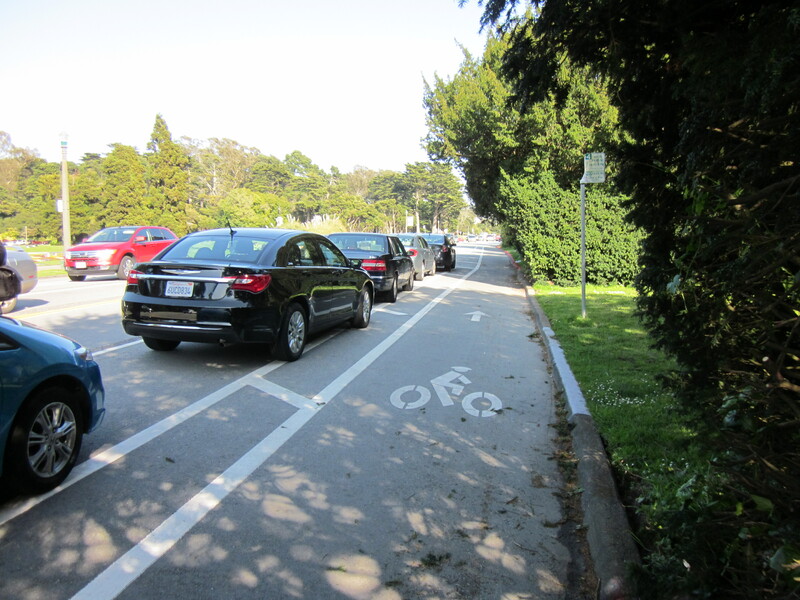 The bike lanes on JFK Drive in Golden Gate Park mostly look like this now–unblocked by cars. This morning I was talking to a dad at my son’s elementary school. With all three of our bikes in the shop (two for brakes, one for an annoying whining sound from the front dynamo), Matt and I played “hot potato” about who had to drive our son to school in the morning. I lost. But it’s always nice to catch up with other families before school lets out. My son’s last day of first grade is tomorrow! This dad asked me if I had ridden in the new JFK bike lanes yet. These are striped to have auto travel lanes in the middle, parked cars alongside, then a door buffer zone, then a bike lane by the curb. When they were first installed drivers seemed to have trouble giving up parking at the curb, which meant I was constantly weaving around cars in the bike lane. With time and some improved signage, this hasn’t happened in a while. When I said that I had ridden on them, he asked if I liked them as much as he did. He thought they were amazing, and that having cars completely separated from bikes, and bikes protected by parked cars, was a fantastic innovation. “They should do that all over the city!” he exclaimed. What impressed me about hearing this, unsolicited, is that no one in his family rides a bike. They like the new bike lanes as drivers. They feel they’re safer. I would never have thought these new lanes would appeal to drivers as much as they do to riders. There are changes in the air, and I like them. If I’m not mistaken, the Netherlands has separate car, bike, and pedestrian infrastructure (at least in high-density areas). It would be great to have certain roads/routes bicycle and pedestrian-only during the work week. It’ll come slowly but surely. In Copenhagen the major roads had three levels: cars in the center at the lowest level, then a curb bump up to a wide bike lane, then another curb bump up to a sidewalk for pedestrians. But on smaller roads the expectation was that everyone would be moving slowly enough that there was no need for separate infrastructure (although there were usually sidewalks for pedestrians–although not always). So there is both road-sharing and separated infrastructure there. I think that division makes sense.